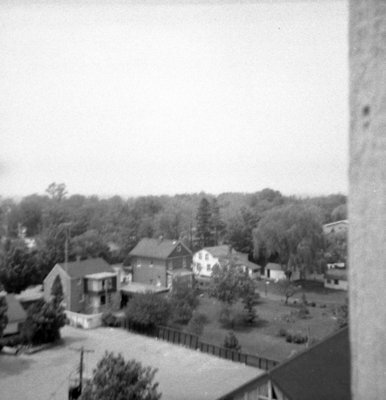 A black and white photograph looking north from All Saints' Anglican Church Steeple. In this photograph the back of houses on a residential street can bee seen. Click the link on the right side of the page to see a similar view on September 13, 2013. Looking North from All Saint's Anglican Church, May 1964, Brian Winter. Whitby Archives A2013_004_346.